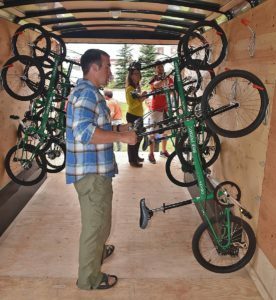 Thanks to a 2015 grant from Alaska’s Safe Routes to School program and support from partners including the Anchorage School District Health and Physical Education Department and Bike Anchorage, Center for Safe Alaskans was able to purchase a fleet of 35 bikes to be used to teach the Bikeology curriculum in ASD Physical Education classes. Interested in riding more safely and confidently? 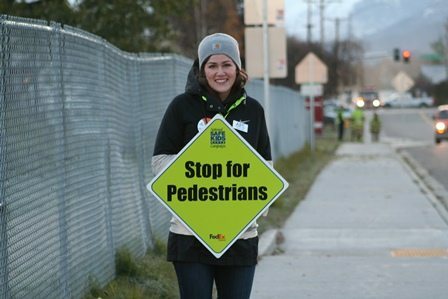 Thanks to a 2014 grant from Safe Routes to School and support from the Municipality of Anchorage, Safe Alaskans staff and others in the Anchorage community have been trained as League of American Bicyclists’ Instructors. The League is the only education program to offer a nationwide cycle instructor certification program. If you are interested in participating in a Smart Cycling course or just want a quick refresher on the rules of the road, please contact us. For more information about the League of American Bicyclists, please visit their website. Safe Alaskans will provide free reflective tape for bikers, walkers, joggers, or anyone who spends time outside and wants to safely be seen. Reflective tape will be available through Center for Safe Alaskans again in fall 2019! At Center for Safe Alaskans, we want to know how many people are biking in Anchorage. Getting a count of riders is an elusive task, but it matters when we are trying to determine if injury rates are decreasing, whether our efforts to promote cycling are successful, and where the greatest infrastructure improvements are needed. The challenges include funding and resources. Planning for BTWD begins after the turn of the year. Multiple volunteer groups are involved with everything from hosting treat stations at busy bike intersections, securing prizes for riders, counting participants and helmet users, promotion, Tshirt designs, and much more. Information about past events can be found at the Municipality of Anchorage’s website. BTWD also has a Facebook Page with information about past events as well as upcoming cycling activities in Anchorage. We are currently exploring how other areas of the country and world count cyclists. The next steps will involve coordinating efforts between the State of Alaska, City of Anchorage and Center for Safe Alaskans. We encourage the use of appropriate footwear and ice grippers to tackle the tough Alaska winter walking conditions. Local Alaska business Skinny Raven offers to put studs in your shoes for a small fee. No slips, no falls with studded shoes. Stud services are $10 and always free for those 60 and over. For more information about pedestrian safety, visit the Center for Disease Control and Prevention’s Pedestrian Safety website. For resources about children and pedestrian safety, visit the National Center for Safe Routes to School, as well as their Walking School Bus website.